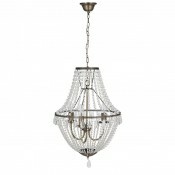 Small Tiffany with black shade with copper chainsBlack and Nickel 60 x 60 x 120 (WxDxH cm)..
6 Light Rod ChandelierGeneral Info: Height including chain : 1520mmDimensions: H: 720mm Dia: 570mm.. 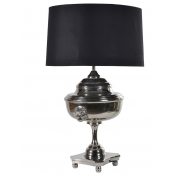 Antique Style Aluminium LampDimensions: H: 590mm..
Bamboo Table Lamp With ShadeDimensions: H: 720mm Dia: 380mm..
Black Thin Bedside Lamp With ShadeDimensions: H: 690mm Dia: 290mm..
Carved/Shaped Lamp With ShadeDimensions: H: 800mm Dia: 400mm.. Ceramic Aqua Jar Green LampDimensions: H: 750mm..
Chandelier CommodoreThis distinctive chandelier will make a radiant addition to your interior scheme..
Chandelier Gregorian LPolished stainless steel atomic-inspired Mid Century chandelier.A chain suspen..
Chrome/Glass Teardrops ChandelierGeneral Info: Height including chain : 1150mmDimensions: H: 240mm W..
Glass Ball Lamp With ShadeDimensions: H: 710mm..
Glass Dome Table LampDimensions: H: 450mm Dia: 220mm..
Globe ChandelierGeneral Info: Height including chain : 1650mmDimensions: W: 500mm..
Gold Glass Lamp With Natural ShadeDimensions: H: 840mm Dia: 500mm..